As usual I went into this book expecting excellence. As usual, I was not disappointed. 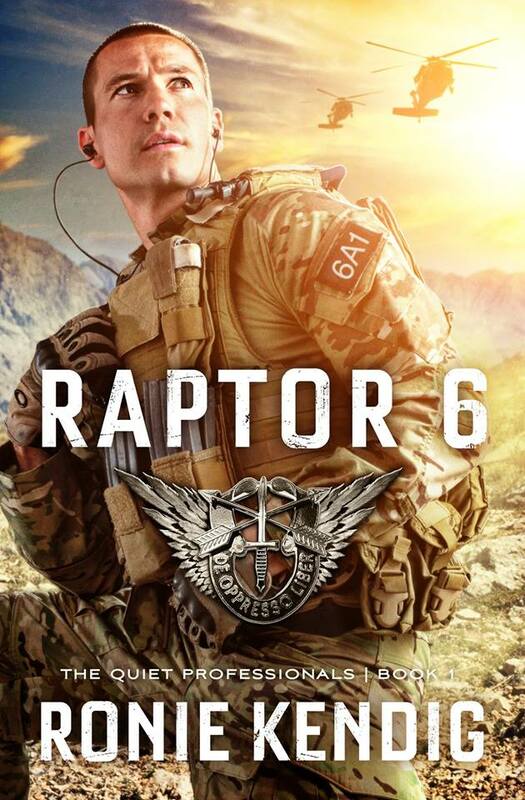 Raptor 6 his hard hitting from the very first chapter and does not let up until the final page. I admit that I’d had a soft spot for Dean ‘Watterboy’ Watters from the ‘Military War Dog’ series. I was so excited for his story and it was worthy excitement. Dean is a tough guy with a soft-spot, though he tries to fight it. Zahrah is a soft-spot all over, though she fights that as well. She wants nothing more than to do what she believes God is calling her to. In the environment she is in though, that is a really difficult mission. She’s determined to do what she must to fulfill her calling, but he’s determined to do what he must to keep her safe. The two do not agree on the best methods for either of these desires. Poor Watterboy has met his match in this fiery school-teacher. I loved the dynamics between them. Dean is so clearly used to getting his way and Zarah is focused on Gods way, oblivious to the position it puts Watterboy in. They are both desperate to help the people they are surrounded by, but not all the people want their help. Some people would like nothing than to see them both dead. When Dean must face his worst fear to prevent his worst fear, he’s only got one person he can trust in… and it isn’t himself. I also have to mention the beautiful, yet emotional, love story that is intertwined in this book. I laughed and… yes, I admit, I cried. Multiple times. This is an action-packed, emotion-filled MRAP ride through the desert. I could nearly feel the sweat rolling down my back and the intense desert heat. My heart stopped when shots were fired at the team, tears for the pain that was felt, desperation warring with hope, triumph and agony. 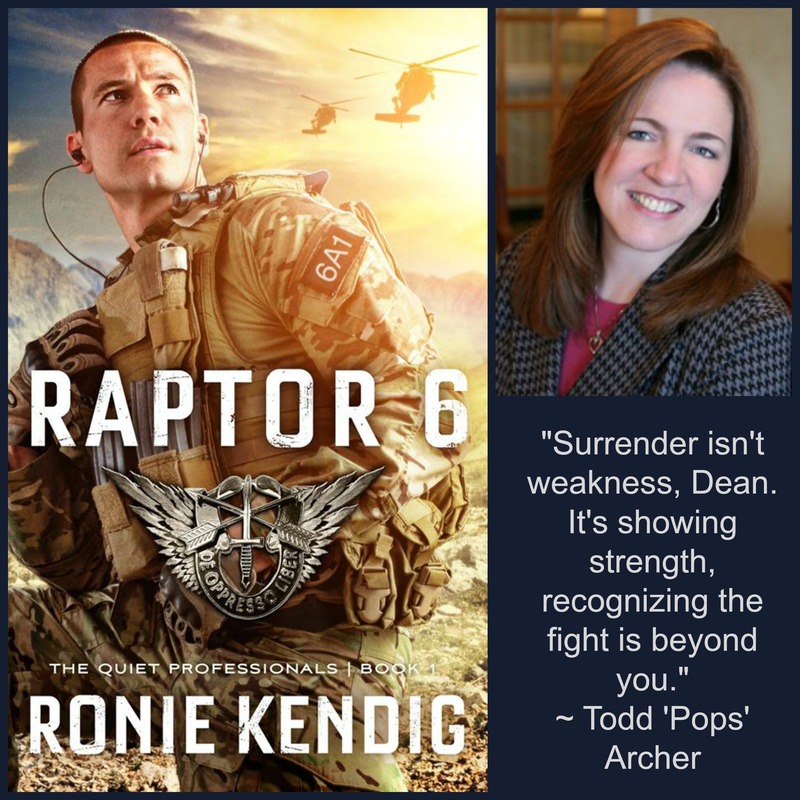 Ronie is a master storyteller and Raptor 6 is amazing! How can you resist the cover? 😉 Isn’t it awesome? ENTER THE GIVEAWAY BY CLICKING HERE!! 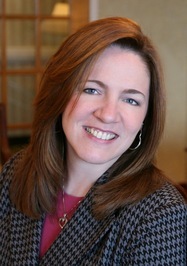 Ronie Kendig is an award-winning, bestselling author who grew up an Army brat. She married her own hunky hero, who’s an Army veteran. After twenty-plus years of marriage, she and her husband have a full life with four children and two dogs. Ronie’s degree in psychology has helped her pen novels of raw, broken characters. Since launching onto the publishing scene, Ronie’s Rapid-Fire Fiction has hit the CBA Bestseller List, won the prestigious Christy Award, finaled in numerous contests and reader awards, including ACFW Carol Awards, RWA’s Faith, Hope, & Love’s Inspirational Readers’ Choice Awards, Christian Retailing’s Readers’ Choice Awards, INSPY Award, The Christian Manifesto Lime Awards, and FamilyFiction’s Readers’ Choice Choice Awards. Ronie loves people and helping other writers through speaking, workshops, and/or mentoring. Find Ronie at www.roniekendig.com, on Facebook (www.facebook.com/rapidfirefiction) , Twitter (@roniekendig), and GoodReads!